Home » lost , television » "The Incident": LOST Season 5 ends tonight... with a bang?! "The Incident": LOST Season 5 ends tonight... with a bang?! - Still trapped in 1977, Jack is hellbent on following through with the now-dead Daniel's plan to change the future and make it so that Oceanic Flight 815 never crashes in 2004. - Daniel's plan to alter history, incidentally, hinges on detonating the Jughead hydrogen bomb before the drilling at the Swan Station releases the energy in what the Swan orientation film called "the incident". - Sawyer, Juliet and Kate are on the DHARMA Initiative submarine that has left the Island. - Dr. Chang now knows that Miles is his son, and that Hurley and his friends are from the future. - Meanwhile in 2007, Locke has taken charge of the Others. He has decided to lead them all on a little hike into the jungle to find Jacob: the unseen "great man" who supposedly calls all the shots for the Others. - What Locke hasn't told anyone yet... except an obviously horrified Ben... is that he intends to kill Jacob when they finally meet him. - And there is still the little matter of Ilana, Bram and the rest of the Ajira Flight 316 survivors who have taken Frank hostage and are presumably headed toward whatever "lies in the shadow of the statue". 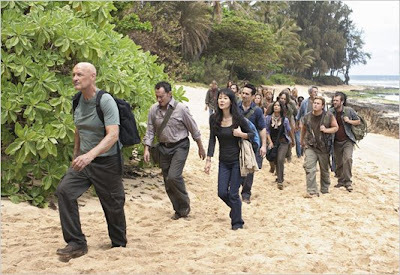 The penultimate season of Lost comes down to a two-hour finale tonight at 9 p.m. on ABC. And "The Incident" threatens to be the most explosive (literally) cliffhanger episode in television history. Will Jack explode the Jughead? Will we finally get to see Jacob? What does lie in the shadow of the statue? And will we ever discover why Richard Alpert never ages a day?! The DHARMA Initiative munchies are being prepared even now. I might try to Twitter spontaneous reaction during commercial breaks. Otherwise, expect the post-episode commentary later this evening.